Child welfare is an all encompassing term covering a broad swath of American social welfare initiatives, policies programs and organizations concerned with child labor, orphans, foster care, child abuse, child care and elementary education. The entries below are a starting point in describing the history of some of these initiatives. A Needed Amendment To Restrict Child LaborAn editorial in The Nation, January, 1934. " The chief opposition to curtailing child labor came from a numerically insignificant but politically powerful group of employers who wished to exploit children for purely selfish purposes because they were the cheapest kind of human help." AdoptionWritten by Professor Ellen Herman, University of Oregon. "Since ancient times and in all human cultures, children have been transferred from adults who would not or could not be parents to adults who wanted them for love, labor, and property. Adoption’s close association with humanitarianism, upward mobility, and infertility, however, are uniquely modern phenomena." Adoption Project: 1937Modern adoption history has been marked by vigorous reforms dedicated to surrounding child placement with legal and scientific safeguards enforced by trained professionals working under the auspices of certified agencies. In 1917, for instance, Minnesota passed the first state law that required children and adults to be investigated and adoption records to be shielded from public view. By mid-century, virtually all states in the country had revised their laws to incorporate such minimum standards as pre-placement inquiry, post-placement probation, and confidentiality and sealed records. At their best, these standards promoted child welfare. Yet they also reflected eugenic anxieties about the quality of adoptable children and served to make adult tastes and preferences more influential in adoption than children’s needs. The Adoption Project paper is a part of that history. Boarding System For Neglected Children (1894)Presentation by Miss C. H. Pemberton, Acting Superintendent of The Children’s Aid Society of Pennsylvania at the Twenty-First Annual Session of the National Conference of Charities And Correction, 1894. This is one of three presentations by distinguished leaders of the era in a section of the meeting on “Child-Saving.” Together, the three entries describe the institutions, deplorable conditions and efforts to reform and improve the care of vulnerable children. C.C. Carstens (1865-1939)C. C. Carstens: Interpreter of the Needs of Dependent Children (1865-1939). Written by: Emma Octavia Lundberg. Child Growth and Development: A Report (1954)Excerpt from Recorder’s Report, Institute on Child Growth and Development, Harvard School of Public Health, 1954. "Rights are derived from basic needs which must be met to insure optimal opportunity for growth and development into healthy individuals and thereby into a healthy, effective society." Child Labor"Historically, 'child labor' is defined as work that deprives children of their childhood, their potential and their dignity, and that is harmful to physical and mental development. However, not all work done by children should be classified as child labor. Children or adolescents’ participation in work that does not affect their health and personal development or interfere with their schooling is generally regarded as being something positive." Child Labor in New York CityWritten by Mary Van Kleeck, 1908. "The following brief report gives the results of a joint investigation made during the months from October, 1906, to April, 1907, into the labor of children in manufacture in tenement houses in New York City. The National Consumers' League and the Consumers' League of New York City, the National and New York Child Labor Committees, and the College Settlements Association co-operated in the undertaking." Child Labor Photographs by Lewis Hine"Lewis Hine, a New York City schoolteacher and photographer, believed that a picture could tell a powerful story. He felt so strongly about the abuse of children as workers that he quit his teaching job and became an investigative photographer for the National Child Labor Committee. Hine traveled around the country photographing the working conditions of children in all types of industries." Child Labor: Children at Work: 1932Article by Gertrude Folks Zimand, Director Research and Publicity, National Child Labor Committee. "One of the many tragic aspects of the industrial exploitation of children is the army of boys and girls who, at the outset of their industrial careers, fall victims to the machine. Each year, in the sixteen states which take the trouble to find out what is happening to their young workers, no less than a thousand children under eighteen years are permanently disabled and another hundred are killed." Child Study Association of America - Statement of Purpose 1913Written by Jack Hansan. "The Child Study Association of America (CSAA) grew out of the Society for the Study of Child Nature, which was formed in 1888. In 1908, the society was renamed the Federation for Child Study and began to more actively disseminate child development information." Child Study Association: History 1928"The Last decade of the nineteenth century witnessed the beginning of educational experimentation based on an awakening interest in child psychology. Gradually invasions were made in the old academic curricula as the needs and nature of childhood became more evident." Child Welfare League History 1915-1920Written by Jack Hansan. "The League had its beginning at the time of the National Conference of Charities and Corrections (later known as the National Conference of Social Work) in Baltimore in 1915, when a group of executives from approximately 25 children's agencies met together for the purpose of exchanging information and discussing the needs of the child-caring field." Child Welfare League of America"Formally established January 2, 1921, the Child Welfare League of America (CWLA) has been one of the most important national organizations in the history of American child welfare. The creation of the CWLA coincided with the end of the progressive era and the beginning of another: an era dedicated to establishing national policies and standards combined with developing and disseminating program materials and practices to affiliate members thereby raising the quality of child caring services throughout the nation." Children Hurt at Work: 1932Article written by Gertrude Folks Zimand, Director Research and Publicity, National Child Labor Committee, appearing in The Survey. "One of the many tragic aspects of the industrial exploitation of children is the army of boys and girls who, at the outset of their industrial careers, fall victims to the machine. Each year, in the sixteen states which take the trouble to find out what is happening to their young workers, no less than a thousand children under eighteen years are permanently disabled and another hundred are killed." Children on StrikeArticle written by Paul Comly French, appearing in The Nation, 1933. "Shocking conditions in the sweatshops of Pennsylvania, where 200,000 men, women, and children work long hours for starvation wages, became front-page news through the efforts of the "baby strikers" of the Lehigh Valley." Children WantedWritten by Beulah Amidon, appearing in Survey Graphic, 1937. "Nineteen state legislatures are meeting this year. Twenty-four states have ratified the child labor amendment; if twelve more act—and act favorably—the amendment will be a part of the Constitution, conferring upon Congress the power, which the Supreme Court has ruled it now lacks, to safeguard young workers." Christ Child SocietyWritten by Michael Barga. "The Christ Child Society was founded in Mary Virginia Merrick’s home at the end of the 19th century as a small relief organization which sewed clothes for local underprivileged children." Crushing Out Our Children's Lives (1931)Written by Helen Keller, an Article in Home Magazine, 1931. "I WONDER how many of you have Miss Abbott's annual report of the Children's Bureau. The part relating to child labor is distressing. Miss Abbott tells us that there was a steady increase in child labor during the three years preceding the present period of depression and unemployment. According to reports from sixty cities in thirty-three states, 220,000 full-time working certificates were issued to children between fourteen and eighteen years of age in 1929, as against 150,000 in 1928." Exploiting the Child (1934)An editorial in The Nation, May, 1934. The Child Labor amendment discussed in this entry was proposed in 1924 following rulings by the Supreme Court in 1918 and 1922 that federal laws regulating and taxing goods produced by employees under the ages of 14 and 16 were unconstitutional. By the mid-1930’s the majority of state governments had ratified the amendment; however, according to Article V of the Constitution, three quarters of the states are required to ratify it before it is adopted. 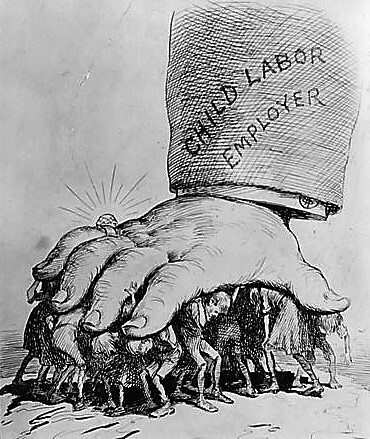 The issue became mute when in 1938 the Fair Labor Standards Act, allowing federal regulation of child labor, was enacted. In 1941, the Supreme Court approved the law. Florence Crittenton Homes: A HistoryThe purposes of this home were to reform “fallen women” and preach salvation and hope to and provide shelter for unmarried, pregnant women and girls. With the success of the Bleeker Street mission, Crittenton became a traveling evangelist, preaching in particular to prostitutes and the unwed mothers. As a result of his efforts, “Crittenton Homes” that provided rescue services and shelter to unwed mothers in an atmosphere permeated by Christian evangelism were established throughout the United States beginning in 1892. Florence Crittenton MissionIn addition to the history of the Crittenton Movement, this entry includes a history of the “Mother House” the first facility of the Florence Crittenton Mission, a poem entitled: “The Soliloquy of a Florence Crittenton Girl” and the Florence Crittenton Homes Association (FCHA) that was established in 1950. National Child Labor CommitteeIn the late 1700′s and early 1800′s, power-driven machines began to replace hand labor for the making of most manufactured items. Factories sprung everywhere, first in England and then in the United States. The owners of these factories found a new source of labor to run their machines — children. Nursery Schools: History (1844 - 1919)Historical sketch of the day nursery movement. "What brought the nurseries so early in our history? It was the machine, the machine which faced working mothers with a desperate choice–the choice between destitution, and leaving their children uncared for." Orphan TrainsBetween 1854 and 1929 the United States was engaged in an ambitious, and ultimately controversial, social experiment to rescue poor and homeless children, the Orphan Train Movement. The Orphan Trains operated prior to the federal government’s involvement in child protection and child welfare. While they operated, Orphan Trains moved approximately 200,000 children from cities like New York and Boston to the American West to be adopted. Many of these children were placed with parents who loved and cared for them; however others always felt out of place and some were even mistreated. Pea-Pickers' Child (1935)Written by Lucretia Penny, appearing in Survey Graphic, 1935. "The death notice in the county paper was not more than two inches in depth but it had, nevertheless, its modest headline: PEA-PICKERS CHILD DIES. Already there had been three deaths in the pea-pickers' camp: a Mexican had been murdered, stabbed; a child had died of burns; a baby had died of what his young mother referred to as "a awful fever in his little stomach." And now the shallow headlines spoke of Zetilla Kane, the seventh child and only daughter of Joe and Jennie Bell Kane." Removal of Children From Almshouses (1894)Presentation by Homer Folks, Chairman, Secretary of the State Charities Aid Association of New York. This entry is one of three presentations by distinguished leaders of the era at the 1894 Annual Meeting of the National Conference on Social Welfare in a section of the meeting on “Child-Saving.” Together, the three entries describe the institutions, deplorable conditions and efforts to reform and improve the care of vulnerable children. Removal of Children From Almshouses in The State of New York (1894)Presentation by the Hon. Wm. P. Letchworth, Member of the State Board of Charities Of New York. This entry is one of three presentations by distinguished leaders of the era at the 1894 Annual Meeting of the National Conference on Social Welfare in a section of the meeting on “Child-Saving.” Together, the three entries describe the institutions, deplorable conditions and efforts to reform and improve the care of vulnerable children. Shift in Child Labor (1933)By Beatrice McConnell, Director Bureau of Women and Children, Pennsylvania Department of Labor and Industry. "Child labor cannot be ignored as a vital factor in the present economic crisis. Children are leaving school and going to work at a time when millions of adults are jobless and many of these children are acting as the sole support of their families because their fathers and older brothers and sisters are unemployed." Vasa Children's Home"History of the Vasa Children’s Home (1865-1955)," translated by Mrs. Dennis M. Lundell. The Vasa Children's Home is the oldest Home in Minnesota and the Augustana Lutheran Church. Widows and WaifsWritten by Dr. June Hopkins, Armstrong Atlantic State University. This essay investigates the connections between the child-saving movement to reform orphanages and the widows’ pension movement in New York City during the Progressive Era. Will the Codes Abolish Child Labor? (1933)Written by Gertrude Folks Zimand, Director Research and Publicity, National Child Labor Committee. "WHEN President Roosevelt on July 9 signed the Code of Fair Competition for the Cotton-Textile Industry, which bars from employment children under 16 years, he virtually removed from that industry several thousand children who will be replaced by adults. Had this action been taken in the spring of 1930, before unemployment became so acute, the number displaced would have been over 10,000."